Can you believe that the end of the first trimester is upon us AND it's almost December? Crazy! 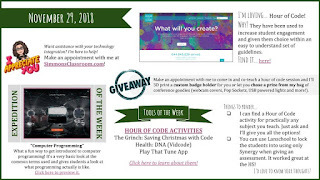 And, as always, you can see the tips from the past weeks by clicking on the slide below and then using the arrows to scroll through the other slides in the deck. The information transmitted herein is intended only for the person or entity to which it is addressed and may contain confidential material. Any review, retransmission, dissemination or other use of, or taking of any action in reliance upon, this information by persons or entities other than the intended recipient is prohibited. If you received this in error, please contact the sender and delete the e-mail and any attachments from any computer. I had a teacher ask me if there was a way to hide or remove students who are no longer in your class. The answer is maybe. It depends on if they are officially dropped from your class and appearing as red in your roster and gradebook. If not, then no, you cannot remove them until they have been unenrolled from the class. 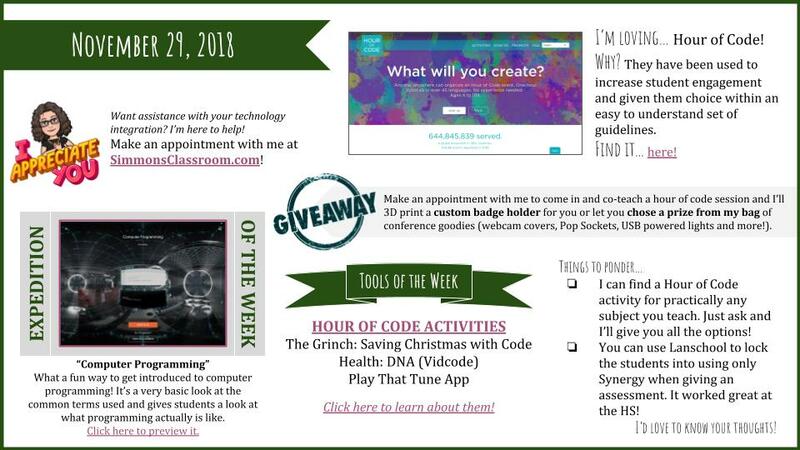 I wanted to send out a message to those folks who are looking to work on technology for your 20 hours of PD time. First off, I have modified my "available" hours on my appointment calendar so that you can now book me until 3:15 on (most) Mondays and Wednesdays. I could even meet longer than that as long as you make arrangements with me in advance. I am happy to meet 1:1 or with groups of teachers to provide any support or training that you need. I wanted to take a moment to give everyone a heads up that some changes have been made to Gmail and the district is going to move everyone to the updated "look" by sometime in June. Although it will still have the same functionality, there are certainly some features that will be new to you. 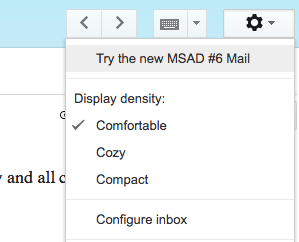 Stay composed: here’s a quick rundown of the new GmailLearn what's new in Gmail I'll cover some of the "biggies" here, but either of those posts from Google will give you a more in depth look at what all the nuances are.